Another HF mini. She made for a great ranger in a campaign my friends and I just finished. Here is Lenore the Sorceress made by Hassle Free. A vile troll for hardy adventurers to pummel. A young warrior, itching for a fight! Thanks! I rather enjoy painting minis and using them in game has added a great deal of fun for my group. Here is another mini I recently finished, it is Not Valeros. He is from Crusader minis Rune Lords line. If that is Sauron, I dig it. If that isn't Sauron, I really dig it! Officially, it is Sauron. But, he will be a great stand in for any big bad villain I need for a campaign. Thanks for the comments! Here are some 20mm Zombies I painted for DMMike. This is the first time I painted in 20mm. I think they turned out really well. A night of the undead. Watch out! Latest and greatest, Human female archer. Eat your heart out Tauriel! A pair of ladies to prepare me for the commission for which I am waiting. I really liked these minis. One is short and toned and the other is tall and, shall we say voluptuous? A half orc ranger, or a villain for hacking and slashing! Designed by me, printed by hero forge. Their new premium plastic is amazing. Durable and detailed. I had these 2 printed up at a cost of $30 each. That sounds like a bit, but to have a single mini commissioned by a professional sculptor would cost you about $300 dollars. I was so impressed with the quality of these prints and the detail. 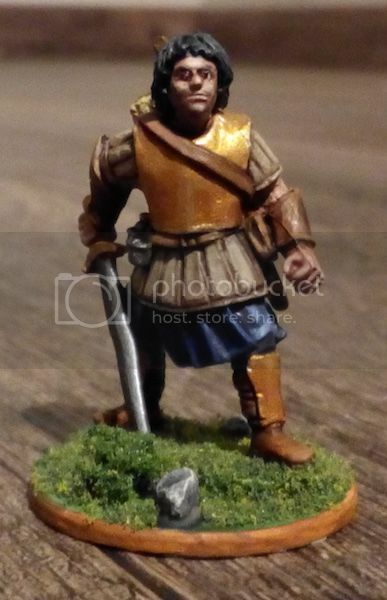 Painting them was also a joy as they represent me and my brother's very first RPG characters. A young fighter named Warren Kael, and a grizzled ranger named Al'Tierra. A villager for the ages! Villiger, or old stern school Marm ? Either one really. What do you need for your campaign is the real question. Here are two more. A head strong teenaged archer and her dwarf companion. In a world of adventurers, some folks are needed for saving. Know your role! Here we have my latest 2 minis, a villager carrying a child, and a grizzled veteran. You never know when you will need a barkeep and his server/maids! The Firecaller. An orc-ish wizard!